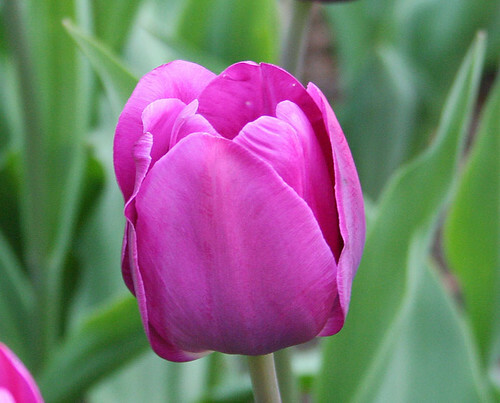 This type of tulip is my favorite. Taken at the Brooklyn Botanic Garden. When I was young, I used to tell my sisters (I have lots) that I wanted to live on a farm. It was a dreamy place. Wide open spaces, green growing things, lots of plants and gardening, maybe a pond. I imagined a large kitchen where I could cook to my hearts content, and a conservatory where I could grow plants year round. Stone or slate floor, water features, nooks where I could curl up with a book and read, and flowers, lots of flowers. My imaginary dream place was wonderful. And then my sisters burst the bubble, or tried their best to disillusion me. Farms, they insisted, weren’t what I wanted. Think Iowa or Kansas, endless rows of corn, or Idaho potato fields. Or maybe a pig farm, or places with lots of chickens, etc. I have to admit they were right, a barnyard full of animals didn’t quite fit in the picture, and neither did rows of corn. (Not that there is anything wrong with either of these, it’s just not for me.) I wanted to dig in the dirt and grow things that I didn’t have to turn around and sell. What I wanted was a ranch. But then they did their best to tell me I’d have to get up early to take care of the horses or milk cows, or feed livestock. So I told them I wanted a ranch without animals, maybe I’d have a horse, but I’d hire someone to take manage the stable. They laughed and I stopped mentioning it. But after all these years, part of me still dreams of that spot in the country where I can spread my arms and feel free, rolling green hills, trails through the woods, gardening, and riding horses. Complete with a professional kitchen where I can cook and a state of the art conservatory incorperating AeroGrow's technology. So when I read The Pioneer Woman’s blog, which is a favorite of mine, it stirs my soul. And I wonder why I live in an urban jungle where the only plant I can grow sits on my desk at work. Then I remember that I can’t get a job in the middle of nowhere to fund my ranch without animals; that I absolutely love the bustle of the city and instant take-out food from any ethnic region of the world; and that ranches in OK, MO, and TX have ticks. I can’t stand ticks. Ticks alone are enough to make a city girl sty in the city. I guess Central Park will have to do.